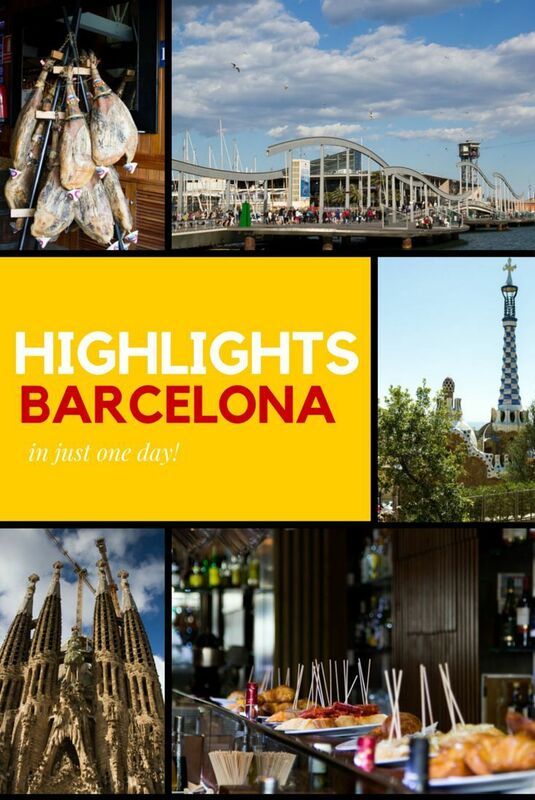 Catch the Highlights of Barcelona in One Day! Barcelona. 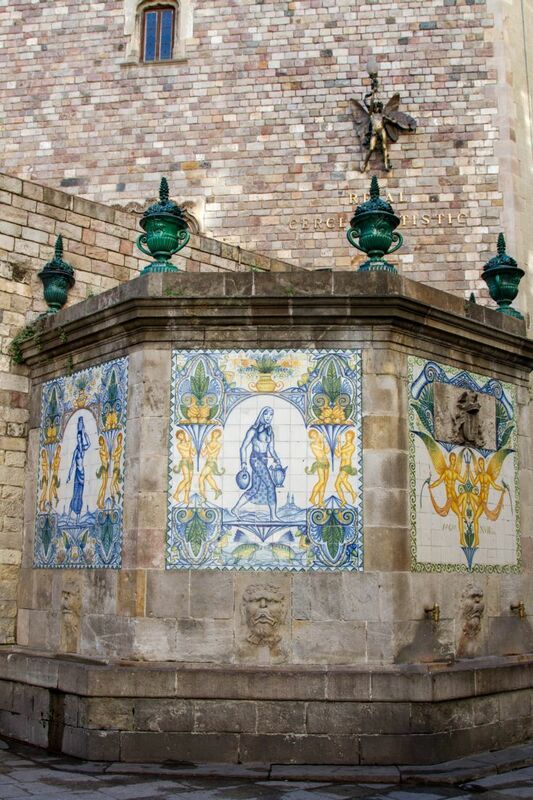 For many this city is merely a starting or ending port for a Mediterranean cruise. But there’s so much going on in this beautiful city, there’s a reason why the cruise ships are here. 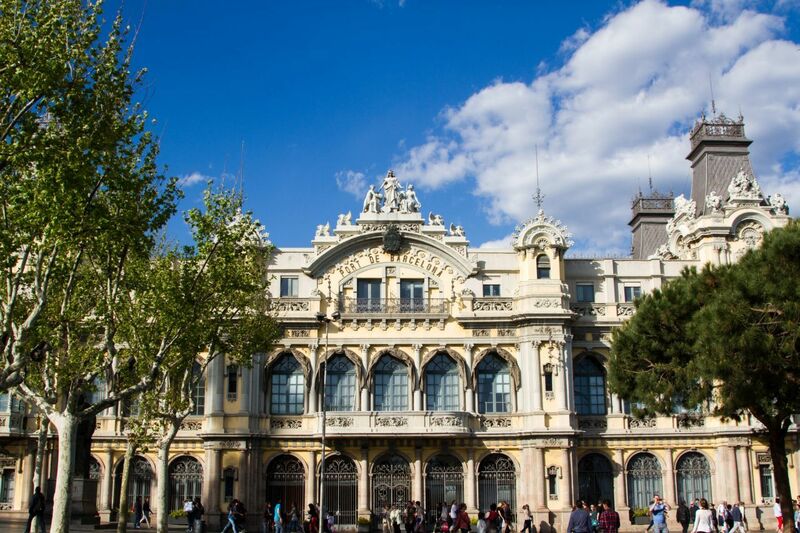 If you’re lucky enough to have two or three days in the capital of Catalonia, you can take your time and enjoy the sights at a relaxed pace, allowing plenty of time for glasses of wine, some tempting tapas, or a rest in leafy green shaded park. However, if time is tight it makes sense to have a good plan for tackling the city and its fantastic sites. We’ve made our list of the top ten things to do when in Barcelona, and if you follow our route, you can do all of them in one day. 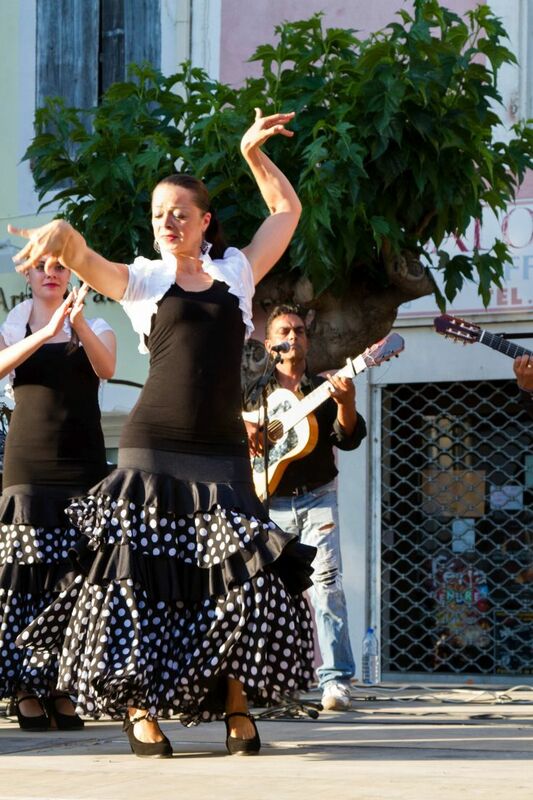 So grab your prepacked day trip essential kit and hit the city; be warned, however, there’s little time for a siesta and the flamenco dancing will keep you up late into the night! Have you been to Barcelona? What were your highlights? This may be one of the busiest markets I’ve ever been to. Packed full of fresh fruits, vegetables, fish, meat, pasties, breads, and delicacies from around the world, Barcelona’s chefs rely on the market to provide them the freshest ingredients for their culinary creations. Walk around the market, pick up a snack or two for the day, and just be amazed at what all you can find in this world class market. For more info, and to find out what’s happening, checkout the official website for the Bocqueria. Continue the walk into and through this oldest part of the city. Here you’ll find architectural examples from ancient Rome up to modern day, and as the name implies, more Gothic buildings then you’ve probably found anywhere else. 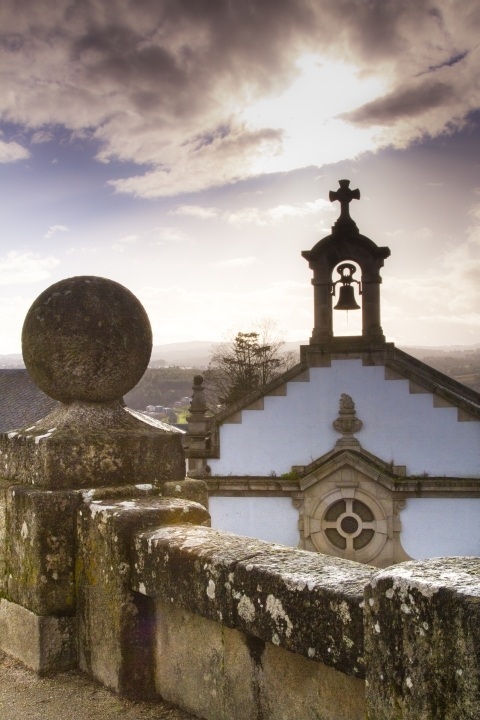 Stroll along the stone cobbled streets and alleys while taking in views of the chapels, mansions, cathedrals and plazas. Take time to visit the spectacular 13th century Gothic cathedral. If you’re getting peckish, we pinned one of our favorite tapas restaurants on the map. There are several excellent museums in Barcelona but this was one of our favorites. The Museu Picasso de Barcelona is housed in a series of medieval mansions which are worth a visit in their own right. But do take the time to see the artwork as well. For opening times and ticket information check the Museu Picasso de Barcelona website. After leaving the museum it’s time to head further out into the city so walk to the Jaume 1 metro stop, hop on the L4 to station Joanic, walk around the corner to the bus stop at Escorial – Pl. 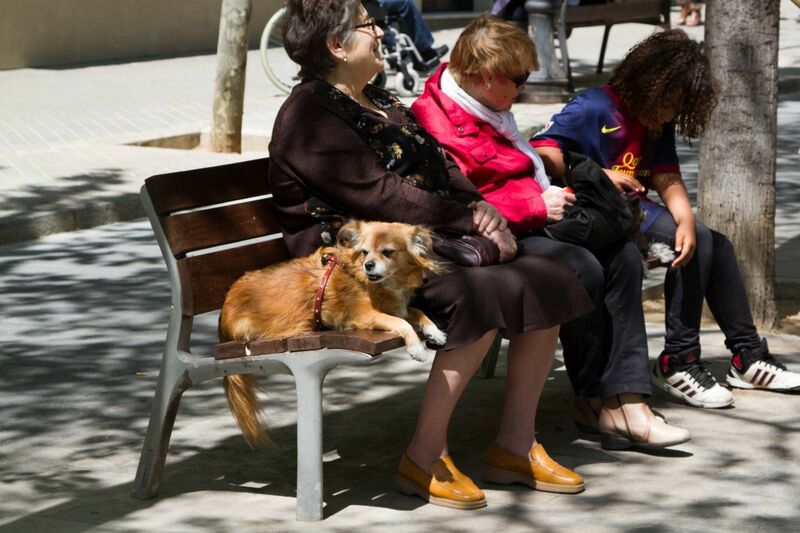 Joanic and take the 119 bus to the stop, Olot-Marianao and make your way to the next site in the top ten of Barcelona. A bit of a trip to reach, Park Güell is well worth the journey. The palace is beautiful and you will love the mosaic artwork, arches, and green spaces. 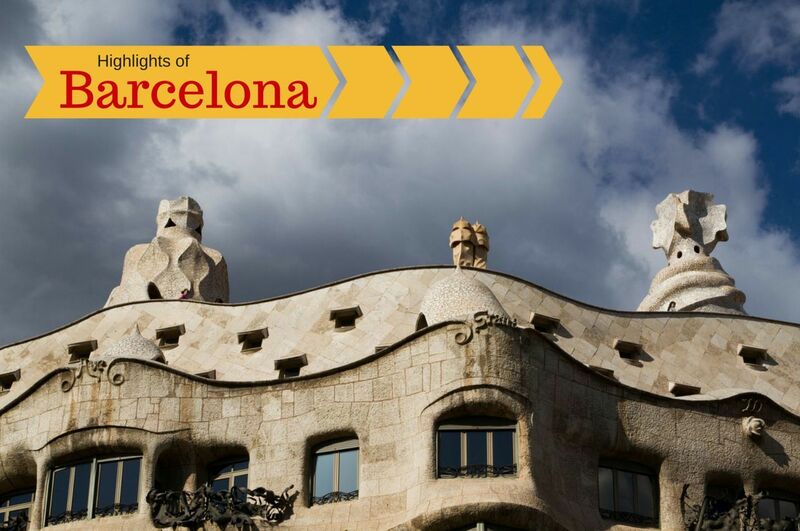 Barcelona is best known as the home city of Antoni Gaudi and this is one of the best places to see his works. Spend at least an hour wandering up through the park and be sure and take your eyes away from the incredible architecture to take in one of the best views of the city. It’s open every day of the year from 8:00 AM until 9:00 PM. 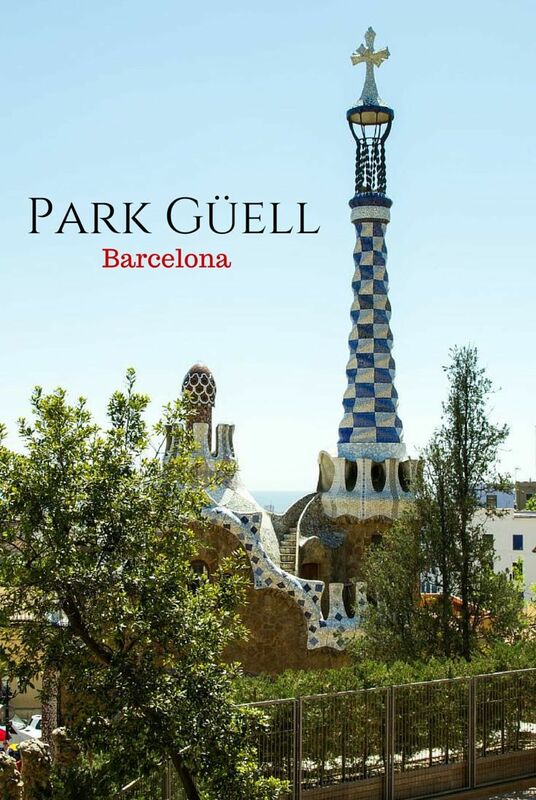 There are parts of Park Guell that are free, but to see the Gaudi portion, you must buy tickets. Again you can do this online and pick a time. I highly recommend you do this. You’ll come out of the park at the top of the hill ,and up till now you’ve only seen it from a distance, but now it’s time to make your way to the stunning La Sagrada Familia. Leave the park from the eastern entrance and get on the Bus 92 from stop Parc Guell to stop Av Gaudi then make your on foot down the colorful Avenida Gaudi toward the cathedral. La Sagrada Familia is synonymous with Barcelona. It is really a must-do. When we visited, I expected it to take me no time at all to walk through the cathedral, perhaps read a little history, and boom I’d be done. I was wrong! We spent two solid hours there and really could have spent more. Walking through the cathedral, I was mesmerized by the play of the light coming through the windows and the completely nontraditional decorations that Gaudi is known for. Underneath the cathedral is a museum that tells the entire history of Gaudi as well as his process of designing the cathedral. Then the museum illustrates how the various parts were built and the technology involved. We had bought our tickets online, and boy were we glad we did. The line of people waiting to get in wound around the entire property. It is that popular. Buying your tickets online allows you to choose the time when you will be there, so you can easily fit it into your day. 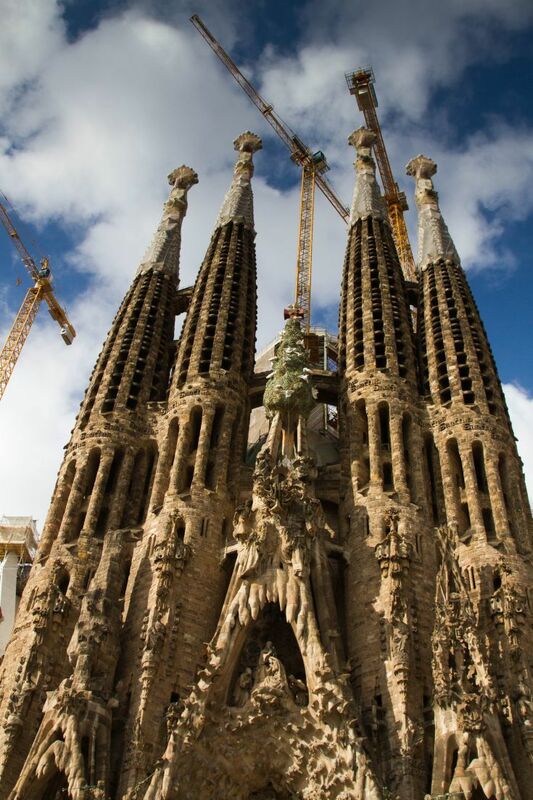 Again, check the Sagrada Familia website for opening times and to reserve tickets. The two best times to go will be mid-day while everyone is eating lunch or as late as you think you can get away with to do what you want to do. From here you’ll take another ride on the metro, taking the L2 from Sagrada Familia station to Passeig de Gracia station. One of the central plazas of the city, Placa de Catalunya is a hub for transportation and pedestrians out enjoying the city. Take a break in one of the many cafes on the tree lined avenues surrounding the square or stroll among the fountains and sculptures for quiet respite from the hustle and bustle of the city. Consider a short detour off the track to visit another of the famous Gaudi buildings, the Casa Batllo is just three blocks up the Passeig de Gracia. When you’re done, make your way out the southwest corner of the placa to the next stop. Some would say this is just another street. But what a street! Leafy green shade trees line both sides of this gorgeous boulevard that cuts right through the heart of Barcelona. 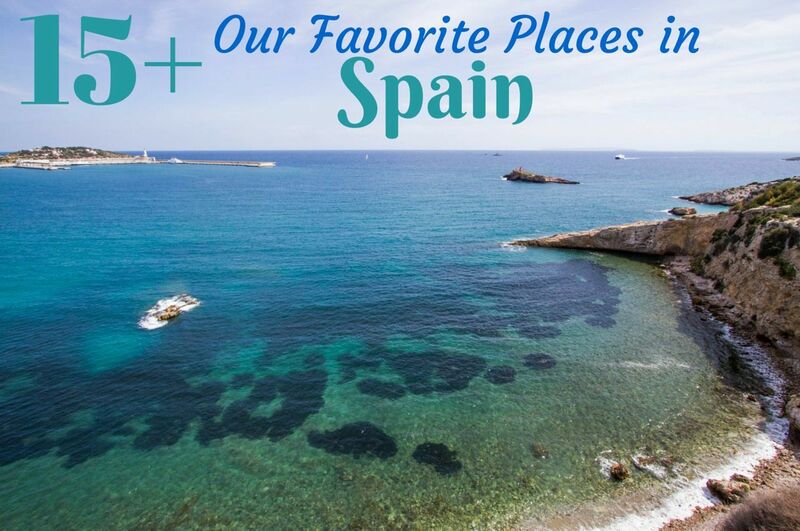 Take your time to marvel at the beautiful buildings, maybe pick up a trinket or two from the many souvenir stalls, or stop in one of the numerous sidewalk cafes for a coffee or a sangria. From sidewalk vendors to sidewalk cafes, there are plenty of things to see. About half way down Las Ramblas you’ll come across the Tablao Flamenco Cordobes Barcelona, and, if you’ve timed it right, your just in time for your dinner reservation. Here I’ll give you a choice. If your a fast walker, don’t spend much time reading signs and placards, or skipped something along the way, then you probably will make it here in time for the 6:00 P.M. seating. Otherwise, you should plan on arriving in time no later than 10:30 P.M. No trip to Spain would be complete with out a Flamenco show and this is one of the best places for it in Barcelona. Check the Tablao Flamenco Cordobes website for exact times and to make a reservation. 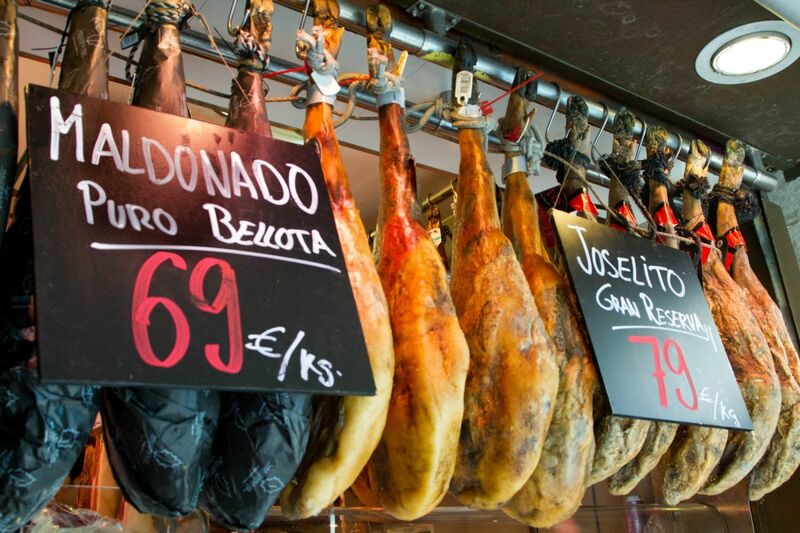 Barcelona is famous for its food and drink. The nightlife here is unparalleled, in a good way. The hot summer days force everyone inside during the blasting heat of the day, and everyone comes out as the sun goes down. Friends and families are out for a stroll or catching up of tapas and wine in local eatery. 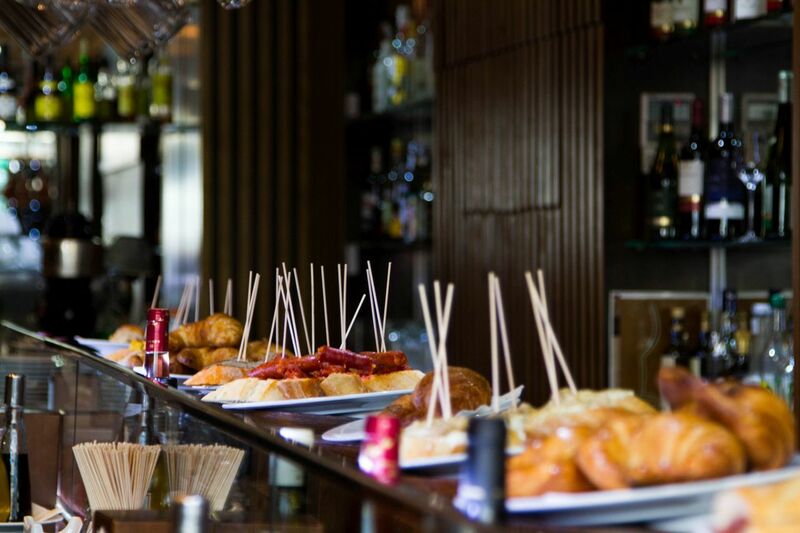 Join in, find a table in a restaurant with too many choices to eat in one night, pick several plates to share around the table and just sit back, relax, enjoy the tastes of Spain, and remember the beautiful sites of the city. 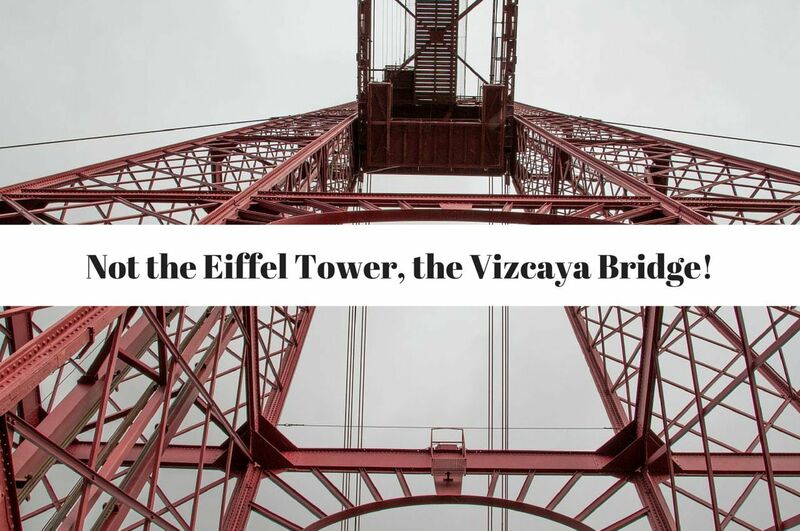 If this list of ten overwhelms you, you could take it slower and only hit the 5 essential sights in Barcelona as well. It’s your choice! 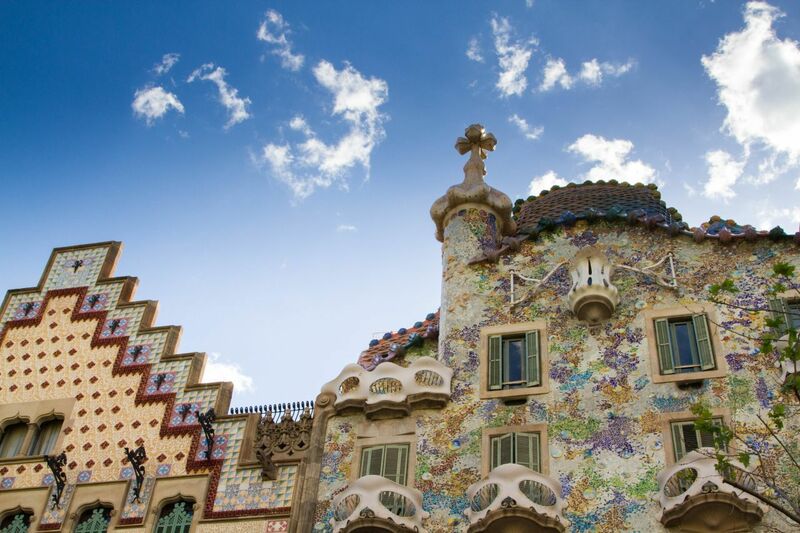 Flights to and from Barcelona to many European cities are cheap and plentiful. Ferries connect the port to Mallorca, Morocco, Italy, and other Spanish ports. Driving in the city is easy and parking is plentiful. Getting around by public transportation is my recommendation. Buy a two day pass that will cover unlimited bus, tram, and metro travel as well as trips to and from the airport. An alternative, at twice the cost but easily more convenient, is the hop on-hop off bus. Taxis are also a good way to get around the city. Additional Reading: Check out this hipster guide to Barcelona with tips on the city’s coolest neighborhoods, where to eat, and what to do! And here’s one if you are looking to take some day trips from Barcelona. We stayed at, and recommend, the Catalonia Portal de l’Angel in the heart of the Gothic Quarter with very comfortable rooms in a 19th century building with a pool. I have to confess I have never been to Barcelona. Shocking! What? Anabel, I am shocked! Just kidding, but you should go, it would make a nice sunny escape when the weather there starts getting too dreary. You managed to get into Sagrada cathedral? When i was there the queue was like 500 if not more peole. Safari, As I said, we had bought our tickets beforehand. I think this is crucial. I hope you get there someday! Suze, It really is a great city, laid back and friendly. Wow, that was a great trip Steve. We didn’t run into any pickpockets in Barcelona but we were warned about them. Clare, I know! It’s one of those cities that I want to return to over and over again. As someone that is currently teaching English here, I’ve done most of these. There are quite a few things to do outside of the city as well. A visit to Tibidabo is definitely worth it, hiking from Sant Cugat to Barcelona is a great activity for the day. Montserrat is also a great place to visit. Tom, Wow! I will have to do some of these next time I go. Ruth, Oh, I agree. I don’t recommend staying in Barcelona only one day, but if you do…. Nilabh, I couldn’t agree more. Thanks for these awesome tips. I promised my mother to visit Barcelona with her. I’ll certainly think of your tips. We went to Barcelona with Jim’s parents, and they loved it. I’m sure your mom will, too. Very nice post, Corinne! It reminded me how beautiful Barcelona is. You can see a lot in a day in this city if you make a good plan. Anda, Thanks. There is a lot to do and see in Barcelona! Another place I want to return to. I loved Barcelona – we spent almost 4 months there near the Sagrada Familia – the Ramblas, especially, the food, the restaurants, the ambience, everything about this city. Thanks for reminding me how beautiful it is. Marcia, Wow! Four months. I’ll bet you really saw it all! Love it. Ibazela, Yes, I understand wholeheartedly. We love Barcelona. As I read your itinerary I was surprised at how many things we both did, and yet how many things were different. That’s one thing I have to say about Barcelona: Whatever you end up doing, Gaudí­ is probably going to be on your itinerary. Like you I spent far more time at La Sagrada Familia than I had expected to. Oh, the play of light through the windows – I think I could have spent even more time there! … but not when you only have one day. We plan to spend more than one day there on our next trip, and I’ve seen the photos so maybe we’ll even spend a whole day at Parc Guell. Barcelona got under our skin. We think it is one of those cities that deserves a few visits. Linda, I have to agree. Barcelona has just a wonderful feel to it; I’m sure we’ll go back. Rob, Well, if you try to do all this in one day it will be tight, so again not much time to explore. Exploring is the best part, too! Liz, It’s a gorgeous place. I can go back over and over and over. Pondering How Travel Has Changed - Is it Better Now?